Does your hair have fly-away strands that just won’t lay flat? That’s one sign that summer is over and dry air is settling in as fall and winter approach. Humidity begins to drop in the air, and you may begin to notice signs of cold-like symptoms. Before you reach for the cold meds, consider purchasing a humidifier. These little electronic devices can turn tap water into helpful cool or warm mists to add humidity to the air inside your home. 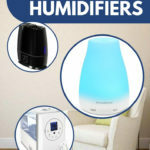 Of course, you want the best rated humidifier, but first, you need to learn a little about the different types, which one is best for you, and how to pick one based on its features.